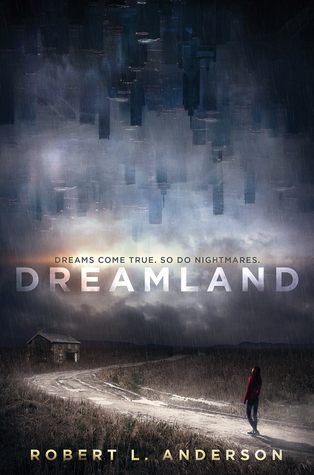 I really enjoyed Dreamland by Robert L. Anderson. It was interesting and different and it went places that I didn't expect. I didn't know all that much about the book before I picked it up and I kind of liked that too. Dreamland is the story of Dea Donahue, this teenage girl who lives with her mother and has this unusual gift of being able to enter other people's dreams. Her mother tells Dea there are three rules to dream walking. 1) Don't interfere with the dreams. 2) Don't be seen. 3) Don't walk the same person's dream more than once. But then a new boy, Connor, shows up and their friendship is something that Dea has never had before and so she starts breaking the dream rules and now the separation between reality and the dream world is starting to deteriorate. Honestly, Dreamland was such an exciting book to read. At first it felt very similar to the trilogy of books by Lisa McMann (Wake, Fade and Gone) which I loved and was a basis for me picking up this book to read but I loved the way Robert L. Anderson took this story in an entirely different direction. Dea was a great character and I loved being inside her idea and exploring both the relationship with her mother and also seeing what Connor's friendship means to her. And everything that happens in these dream worlds was fun too. My mind did wander on some of the really descriptive elements of the dreams but overall I found it very fascinating unravelling the mysteries this book throws at the reader: how and why can Dea walk dreams? What has happened to Dea's mother? What is stored in Connor's memories and dreams of his childhood? I loved how all the different strands of this story come together and as I mention, a lot of was unexpected. I think it takes a lot for me to be surprised by a book but Dreamland definitely surprised me. Such a fun and unusual concept for a book and I highly recommend it!